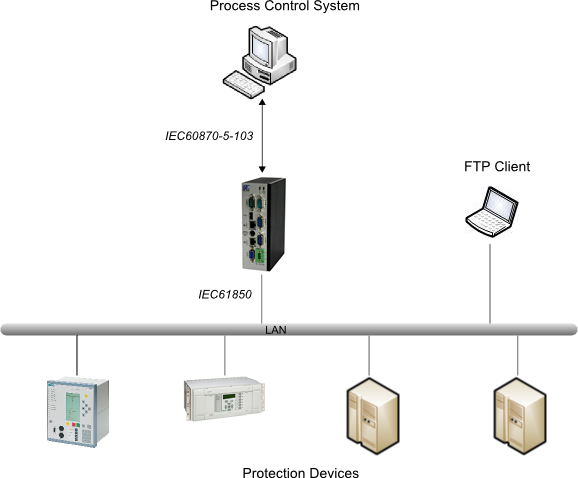 The IEC 61850 protocol has become a standard protocol for communication with protection devices of different manufacturers. Other intelligent process control devices partly support the IEC 61850 protocol as well. This protocol is able to exchange digital and analog information and commands and provides the opportunity to transmit fault records. IEC 61850 is not limited to pure data transmission; it also defines a complete data model. An XML based language (Substation Configuration description Language - SCL) is a vendor-independent manner to describe devices and their configuration. ipConv provides the protocol stack IEC 61850, Client to communicate with IEC 61850 devices. This stack supports process data transfer as well as file transfer. The configuration of the data points to be transferred is done by SCL files, which are first exported from terminals to be connected and are then imported into the protocol stack. Selection and modification of the data points to be processed might be carried out with an efficient spreadsheet analysis software such as Microsoft Excel. After tripping a protection function an IEC 61850 device saves binary and analog values recorded over a specific period of time in the COMTRADE format (IEEE Standard, Common Format for Transient Data Exchange) to enable analysis of the fault based on the recorded data. If a fault is detected ipConv reads the file from the device and saves it on the gateway in order to process it. If disturbance data need to be transferred to a control system per IEC 60870-5-103 protocol - a common protocol in the field of protection equipment as well - the disturbance data are internally converted to information objects compliant to IEC 60870-5-103 and transmitted according to protocol specific requirements. There is also the possibility to read out the original COMTRADE files (e.g. using FTP client) directly from the ipConv gateway.